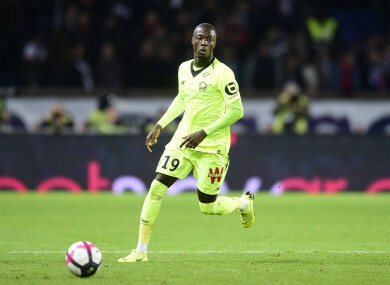 ARSENAL, AND ANY other suitor of Nicolas Pepe, have been made aware that it will cost €80 million (£72m) to secure the Lille winger’s signature. The talented 23-year-old has emerged as a target for leading sides across Europe. The Emirates Stadium has been mooted as one possible landing spot for the Ivory Coast international. Lille, though, are aware that they have a prized asset on their hands and will not be parting with him unless a hefty price tag is met. The Ligue 1 club’s sporting director, Luis Campos, told Telefoot of Pepe: “I hope he will stay this winter. We’ll do everything to keep him. “All the top clubs in the world have their eyes on him, and that’s normal, but the president has been clear. “The idea is for him to continue at the club. “In contrast, with my experience in football, I would say that if a club arrives with a big number and can convince the player… I would sell him for €80 million. Pepe has certainly enjoyed a productive opening to the 2018-19 campaign. In just 19 Ligue 1 appearances this term, he has contributed 12 goals and five assists. It is that productivity which has him attracting admiring glances from afar. Arsenal boss Unai Emery, who got a good look at Pepe during his time in charge of Paris Saint-Germain, is said to be a big fan. The Gunners already have plenty of creativity on their books, but the opportunity to bolster those ranks will not be passed up if an opportunity presents itself. Email “Arsenal warned it will take €80 million to secure Lille winger”. Feedback on “Arsenal warned it will take €80 million to secure Lille winger”.